This was a shot of my eldest Ruth and my little boy Josh exactly four years ago on their way to my brother's daughter 7th birthday. 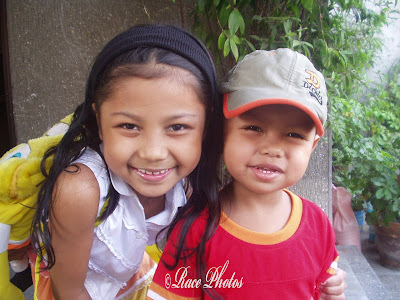 Ruth was just a little 8-year old girl then while Josh was barely 2 years old. These two kids of mine have a habit of teasing each other up to the point that one will cry in the end. Actually the eldest will tease the youngest up to the point that he'll cry and go to my side then she'll stop. Then after that they will play as if nothing happened. They're a handful sometimes. The middle kid Gen has a more matured attitude and she pampers Josh to the max! I love their smiles here, sweet!!! Doesn't time fly? I wish we could hang on to those younger moments a bit longer. Your children are so sweet. awww they are both cute!!! Ang sweet naman ng mag-ate. Happy RT & WW!